On the way back from Craigdarroch we stopped at the Art Gallery of Greater Victoria. The gallery is about a 10 minute walk from the castle and is located at 1040 Moss Street. On coming to the front of the gallery you might be taken aback by the fact that a very modern looking structure has grown out of a Victorian manage – like very unlikely Siamese twins. The Spencer Mansion was built in 1889 and was donated by Miss Sarah Spencer in 1951 to become the Art Gallery. As the collection grew new exhibition spaces were added between 1955 and 1978. Exhibit-wise there were a couple of things going on: an exhibit by Don Jean-Louis called Silver Works, an exhibit called Lot in Life which explored activities we do to survive, Lab 8.3: Reconstitution by Nicholas and Sheila Pye – a video installation representing a modern triptych, and an exhibit called Emily Carr and her Contemporaries. 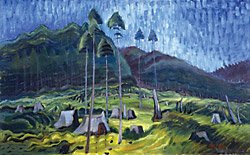 Emily Carr (1871 - 1945) was one of Canada’s most beloved artists. She was also the mentor of Myfanwy Pavelic (1916 – 2007) best known for her portrait paintings. Both Carr and Pavelic were Victoria-born and Victoria is rightfully very proud of them.